I love new stuff, and especially tech-stuff. I decided I would jot down a quick post on some of my favorite new found things in 2015, even though I know many of them saw the light of day before 2015. Tesla: I got to drive the Tesla Model S during Christmas break and I was stunned. The car makes you not only feel like BatMan, but it works perfectly and seamlessly like any other non-electric car. Dealing with the hassle of charging stations felt slightly annoying at times, and especially during longer drives. However, the feeling of driving a smooth computer trumps that. Apple Watch: I removed it for one week to see if I missed it. Surprisingly, I did! I had thought I wouldn't, but I found myself constantly checking my phone and worrying whether I had missed something important. Wearing the watch gives me the added security of never missing anything important, all the while being able to disconnect from the time sucking phone. Venmo/Swish/Vipps/Apple Pay: I love fast and easy payment. Please, dear banks and financial institutions, continue to make payment seamless and convenient. Squarespace: I have used it for a while, but it keeps getting better. This year I created four website using it. Love it! Upwork: Found a developer and created two digital products using a creative and smart guy in India. This platform enables anyone to become an entrepreneur quickly. Sketch: No words for how much I love this design tool. I tried to navigate my way around all sorts of digital tools earlier, as well as get my hands dirty in the Adobe harem. However, with Sketch, I have everything available, it works, it looks good, it is the preferred design tool amongst modern developers and it is so, so damn easy. Spontano: I recently moved to Stockholm, and just as I used to navigate New York with Sosh, I now use Spontano to find the stuff going on around town. Never a boring evening. I got tons more, but these are the most important ones for now. Hope you find joy in one of them too! I remember it vividly. A cold morning, April 10th at 9 AM in Oslo. I was in fight mode, clutching my iPhone, staring frantically at my Mac screen beaming the apple.com homepage "We are making updates to our site. Please check back soon". My sister, living in New York, was staring at the same message ( to her agony as it was 3 AM her time and she had promised me that she would order the watch from there in case Norwegian networks failed me. I have a good sister). Not surprisingly, the site crashed. A quick meltdown and 35 iMessages to my sister later, I took to Twitter for advice. My friend in San Fransisco saved me in the most obvious way. I blame my panic for the obvious (and embarrassing) fail. @isabelleringnes : use the Apple Store app. I can't believe you didn't do a test-run of today. 3 minutes later I found myself in a celebratory dance to the ding of Apple's order confirmation email. 8 minutes of frustration pushed me 4 weeks back on the waitlist, but I was still going to be one of the very first million Apple Watch owners. I could feel the nerd-adrenaline all the way to my spine. 6 weeks of feeling like a child waiting for Santa to slide down the chimney passed. The watch was on my wrist. I have now been wearing the Apple Watch every day since that glorious day, May 28th. Two months. Despite gloomy reviews and rumors about luke-warm early adopters, slow sales and "too little, too late" my opinion of it is biased, but satisfied. Every time I meet someone with the watch, a silent understanding occurs. "You were one of the crazy ones too". All the features Apple promised are present. Apps, activity, notifications, images, messages, phone calls, payment. Check. It's surprisingly satisfying to deal with those sweet pings instantly. I can sense the curious looks when I am talking to my hand. I can not understand how anyone in the US would choose to not use Apple Pay. Many do not even know it exists. It is the smartest, easiest, safest and most convenient payment today (in my opinion). I am constantly "in the know". No more excuses. If I haven't moved enough, it tells me repeatedly. So much so, that I might even do something about it. Like take the stairs instead of the elevator. I absolutely love the design. It makes me feel cool. I wear it with dresses and sports clothes. I love the haptic feedback. The tiny vibration that occurs with a slightly different vibration for each notification is addicting. Everything about it is thrilling. Weird, but true. I do not want to be constantly reminded every time I am focusing that I need to stand up. Leave me alone. Every time I check the weather it still shows me the weather in a location I was at one week ago. Like now, I know it is sunny in New York. But I am in France. I don't really use it. Sure, I wear it all the time. I dismiss notifications. I check the time. I quickly respond "yes" to messages. Maybe I track my activity. But I have never checked any real apps on it, it is too slow and the screen size is too small for that. I save those goodies for the big screen. Siri is getting on my nerves. She understands what I say about 80% of the time. And because the only way to text is through voice, the language barrier gets frustrating quickly. No one else has it. I was looking forward to sending my heartbeat and special smileys to my Apple watch buddies. But no one I know has one, so I have to keep my heartbeat for myself. Poor me. I am actually pleasantly surprised by the length of the battery time. And the speed at which it recharges. But still, I am now carrying two chargers in my bag. Cables everywhere. Can we invent infinite battery time soon? It has so much potential. But it is not living up to it yet. Upon questions of how I use it, I find myself sometimes white-lying about all the use cases. Yes, I know they are all possible. But the software is not fast enough for them to actually beat the convenience and speed of my iPhone. Should you buy one now? No. Unless you are an early adopter, gadget-geek or an unparalleled Apple fan, it's not for you. The average consumer is less patient and tolerant, and this device requires exactly that. Will everyone have one some day? Maybe. It is still too early to say. Perhaps when Apple Pay is rolled out and accepted worldwide the benefits are more obvious. It has a lot of potential, but that's about it. The media industry (or actually every industry) has been affected by the internet. The “EXTRA””EXTRA” component of a fresh newspapers on the sidewalk has evaporated along with its emergence. News is at our fingertips, one click away. Information is no longer a scarcity, but ubiquitous and universally available. But is the quality and quantity emerging in separate directions? I believe that in order to attract and retain news consumers, readers and subscribers, the industry needs to find means in which people will feel like it is worth coming back to the source. They need to be willing to pay for content; simply because the quality, technology and deliverable of the news experience is unique. A great example of news organizations that have seen some success from applying these practices are Fast Company and The New York Times. Fast Company Magazine invests a lot in the technological aspect of their articles, making every reading experience unique and magical. Take this article as an example: instead of a static image they employ a format that allows the image to come alive while reading the article. This image seems static here, but I urge you to check out the article for the full immersive experience. nother example stems from the New York Times. They have invested in interactive content, that tells a story through videos, graphics and interactivity. It is really quite beautiful. They have an entire library of their best work here, but being a slightly biased Norwegian I suggest you check out their feature on a trip through the Norwegian fjords. It is a truly beautiful article and really makes the reader feel like they are present in the moment. I believe that in the future we will be moving away from the typical smartphone in our hand and start seeing information displayed on the world. Everyone has a different idea of what the future will look like, but it seems that the consensus is that we are moving away from a containment environment to information everywhere. The technology is available, but needs refinement and implementation to transform the world as we know it and disrupt the ways in which we consume news. But will the news industry as we know it survive the rapid accelleration of technology coming our way? I believe in the importance of high quality and reliable news sources. But in order to stay relevant, impactful media houses should push to revolutionize what people think of as the ultimate news experience by incorporating truly unique ways of experiencing news such as using augmented reality , projection technology and 3d holoGraphic technology. The true journalists role will no longer be to just hammer out a script, but build stories that give users a new, innovative and exciting way of consuming news. I believe that this experience will be worth paying for, and without the added cost, it can not be produced. Augmented reality has become a common concept, but this technology is about to transition into a form that can display graphics for each viewer’s perspective. The technology is currently used by some advertisers to turn print ads interactive, magazines to make stories come alive and corporations pushing direct sales from scanning an image. I imagine people being able to scan a particular place and and see the current news stories unfold interactively within their mobile device. Using geo-location, the internet and surrounding data- you could walk around anywhere and receive real-time stories about things going on in your local area from news sources and social media. Imagine walking anywhere, scanning whatever is in your eyesight and see a projected augmented layer providing tidbits of news information on whats going on. By pointing your phone, glass or projector device to an area of interest or conflict you would automatically receive dated and current news, social media posts and pictures about that place in real time. Haven’t you ever walked by a fire truck or police tape and wondered what the commotion is about? Imagine if you could point your phone at it, and satisfy your curiosity within seconds. The basics is that a projector (on a phone or any wearable device; glass,watch, earring, necklace, button) can turn any surface into an interactive projected newspaper. A user can essentially examine the world, find and process the stories based on geo-location and personalization, aggregate information and pull data from news sites and social media and then project the information as a personal newspaper (like flipboard) wherever your eyes desire- be it a wall, table or your own wrist. This would give news consumers constant access to news in whatever form they wish in an entirely new and engaging way. The technology would be touch and voice activated, enabling the user to demand any action to be taken with the use of his/hers voice or gesture. Using gesture recognition technology, the users could interact with the projected information without using their phones, but simply by gesturing onto or around the image projected. They would flip pages like an old school newspaper by waving their hands over the projected interface.Readers and consumers could comment real time, using side notes and social media. News organizations can incorporate comments in their articles using “side notes” technology. This means that when you are presented with news anywhere at anytime- be it your bathroom, bedroom, livingroom, kitchen table or car- you can comment by voice/or a projected keypad to a specific sentence and contribute to the overall crowdsourcing of information derived from a specific segment in an article. The projection hardware could read stories out loud, or the consumer could read or watch them themselves. In that way you can both experience the newspaper in a technologically advanced manner while still being a contributor and narrator of the global curation of news. This technology can unfold in two dimensions- both projected on a surface or contained within your phone’s screen. Imagine reading an interesting story on your phone. Now picture being able to click it and see it come alive as a holographic 3D version in front of your eyes. Like a theatrical experience you would be able to see the events in Syria or the latest inventions from South by Southwest in holographic 3d directly in front of you. Maybe I am wrong, but I believe that if journalists expand their skill set to offer these kinds of experiences consumers will come back. Not everyone can generate this high quality content. It will disrupt the cold, passive newspapers as we remember them. And it may already be in the works. On april 29th, 2014 Apple acquired a patent for a holographic display technology that allows users to interact by gesture and touch with 3d objects for possible implementation in their hardware. What do you think is the future of the news? What big trends do you see coming our way? What are the implications? Today I am very pleased to announce that my former boss at VG and I have launched a new network for women who are passionate about technology. It is launched in Beta and we have yet to decide how we are going to move forward and what our game plan is, but it is exciting to have gotten it out there. My partner Camilla is extremely talented, creative and passionate about technology so I think it has the potential to turn out pretty awesome. I for one cannot wait to connect with other girls my age and trade useful resources, trends and tech-events with each other. When I moved home from New York I found that the Tech-bubble I had gotten so comfortable living in did not exist in Norway. I couldn't seem to find any women deeply passionate about tech, wearables, software tools... However, there is not a lack of men interested in technology. They are everywhere, carving their way up to executive positions. I followed a very important series on NPR before the summer, called Woman in Technology. Featuring a variety of female innovators in tech they were able to produce in depth stories, insights and key facts and figures about females position in the tech industry. The series helped open my eyes to the importance of women taking a stand in what has become a highly male dominated industry. Just this past week I heard an interesting story on Planet Money about why women stopped coding. Apparently the marketing industry has had quite an influence on womans role in tech. In 1984, when computers began entering households for the first time, they were marketed to young men as a way to play games. Women started to shy away because computer-ads were so heavily focused on science fiction movies with typical male audiences. Computers were given to the boys, or placed in their rooms. Even though I was one of the first ones to enter the computer class in first grade, I was the only one of 15 guys and 3 girls. And when I didn't understand it, I felt stupid and would shy away. Our teacher was male and he focused on teaching us games. The girls were not interested in games. We wanted to create nice invitations for birthday parties and create pretty presentations for each other. Not surprisingly, my younger brother got our families first laptop, and I was lucky enough to inherit it two years later. I intend to encourage my children equally in all subjects in school. I hope that by the time I have kids, computer science is a required class in middle-school. But more importantly, when we teach young girls about computers; teach it to them in a way that appeals to them. Studies from Harvard show that when it comes to technology, women are interested in learning what more they can do with it. Guys are interested in why they are able to do what they know. Both are important skills, but when you teach a class described as "how technology X works", that is not going to appeal to women. Apparently, using words like creative and problem solving seemed more approachable to women. I find this fascinating. Women and men are not driven or motivated by the same things. By taking into account the passion and needs of women, the school was able to increase the female to male ratio from 10-90 to 40-60. Have you ever noticed that whenever you are in a meeting and the power point won`t work someone immediately cries for a "tech-guy"? If a girl gets up I am ashamed to say that I am both proud and surprised. It is has become one of those unnoticeable moments we experience on a weekly basis. The frequency of a male getting up to "fix the tech" has made us blind to the fact that women should be and are very capable of "fixing the tech" it as well. And it goes both ways; I can't remember the last time a manager asked a man to take notes or get coffee during a meeting. Women have come a long way in Norway. We still have a long way to go, but we are further ahead than most other cities I have been to. There is no time to lay back and reap the benefits of what our previous generations have fought. This is not a competition between men and women. It is the scientific fact that we are better together. The belief in one gender does not indicate the disbelief in another. I believe that women are capable of becoming equally interested in technology as men. There is no doubt that they are out there. Now I am looking forward to connecting with them, encouraging and learning from them. Google is expanding their initial glass explorer program to include anyone who wants to test the company’s wearable computing glasses, which are famously still in the beta development stage. The giant tech company initially launched the (in)famous innovation last year to a small pool of lucky “glass explorers”. Curios techies were encouraged to creatively express what they would do #ifIhadglass on Twitter. The most creative tweets won the opportunity to pay the company $1500 (excluding tax) for a chance to see the world from behind Google Glass. But the majority of these “Glassholes”, a popular term in which these explorers have famously claimed, are not defending their pricey investments. According to many of the beta-testers, the battery life is poor and their use limited, crediting it to essentially be a wearable camera with worse image resolution than your phone. Google released the product targeting engineers and developers hoping that they would help improve the product before it reached the public eye. The device has received a significant amount of media attention, primarily for the flux of raised privacy and safety concerns. In addition to lobbying for it’s legal commercial usage in Washington, Google’s engineers are working hard to further improve the product, which currently offers video recording, email access, turn-by-turn driving directions and Internet search by voice and touch commands. However, the command phrase “OK glass” combined with the unusual design has yet to become socially acceptable. But despite the glasses exclusivity stamp, they are likely to be considered too expensive for the general public whom have shown little interest in acquiring a pair. Industry experts estimate the actual manufacturing price to be below $200 and express Google’s need to lower the price significantly before the average consumer will consider taking on more cyborgian appearance. It may be smart to stay on the sideline for now, as both the product and price are expected to improve in the near future. Another amazing invention is about the rolled out and may save millions of lives. The "Drinkable Book" essentially teaches water safety, but the real magic lies within the pages themselves that are made of a material that cleans drinking water. The pages, coated with bacteria-killing silver nanoparticles, are meant to be ripped out and used as a filter to kill bacteria that can cause cholera, E.coli and typhoid among others. And the pages last for a month each! This book may provide clean water for up to four years. Waterislife, the organization behind the invention, has launched 100 copies printed in English and Swahili in Kenya, but plan to distribute them globally with time. 3,4 million people die from water related disease each year and most of them have no idea that the water is unsafe to drink in the first place. The chemist, Dr. Theresa Dankovich, invented the pages with the bacteria killing effect. Watch the video to see more. Go to this page to help support the project. Grace Choi demonstrating the Mink printer that may revolutionize the beauty industry. Harvard graduate, Grace Choi, recently introduced a new technology and product that may disrupt the beauty industry. Essentially, Choi created a product that allows consumers to 3D print their own make-up in whatever color they want using high quality ingredients- within the comfort of their own home. The prototype, called "Mink", let's users choose exactly what colors they want and print out the make-up in that exact hue using a specific software that she has designed. Consumer's can simply locate colors online, use a software that identifies the hue's hexadecimal number and then print the colored dye onto a powder substrate that resembles the raw material of branded make-up. The material is described as high quality and FDA-approved cosmetic-grade dye. The printer's cost is estimated at $300 USD and will be about the size of a Mac Mini. The product will target young girls who want to experiment with new colors and make-up. As wearables and the recent rumors surrounding Apple's (hopefully) upcoming iWatch I started thinking more about the Internet of things and how Internet-connected devices will change online advertising in the near future. Presently the online advertising and marketing industry have not paid much attention until recently, perhaps not fully understanding that it may mean a future without "traditional" online advertising. The first signs can be found in native ads, curated content, and the introduction of voice-assisted apps Google Now and Microsoft Cortana. If you have not tried Google Now, I highly recommend it. I can't quite explain how satisfying it was to receive a reminder and direction to the restaurant I had made a reservation for on Friday night without even lifting a finger. Consumer-packaged goods companies have begun testing semiconductor chips and radio frequency identification technology (RFID), to monitor the movement of finished products to distribution facilities and on to retail store floors at Walmart and Target. Car manufacturers have used this technology to replenish parts in their supply chain for a while. 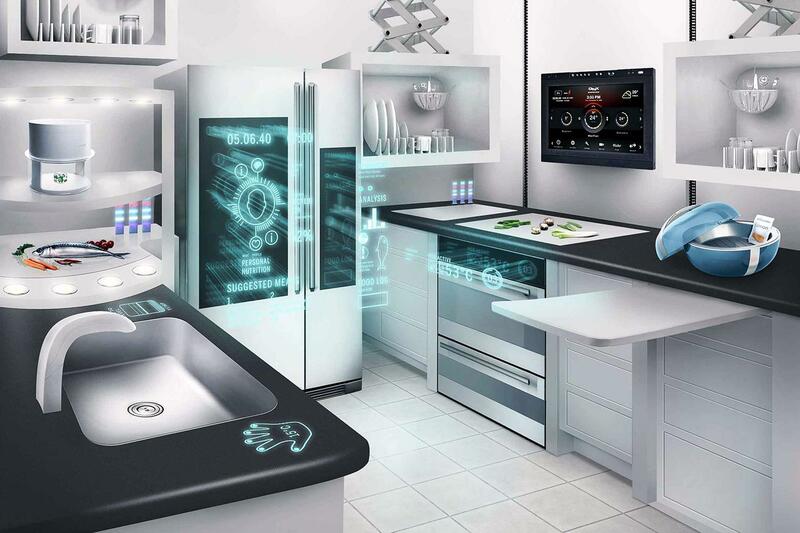 The electronics industry has been in the forefront of realizing that the Internet of things will someday materialize, and that consumers will be reachable in ways the industry currently have not imagined. The developments will enable companies to personally connect with consumers on an entirely new level. If one is able to develop security and privacy standards that consumers are comfortable with it, talking electronic appliances like refrigerators, televisions, heaters, cars, even electronic chips operated into our bodies will be able to predict our next need before we are consciously aware. The move for marketers will happen in waves as market segments begin to understand the transition and the use of data to push information and content to consumers. Automotive manufacturers are among the first to build a business model, connected cars, aligned with this shift. Agencies can now take that technology and push information to the consumer, telling them to take a specific route to save money and gas. They can then navigate them to a specific gas station based on that stations daily offerings. Retail brands are embracing technological developments as they continue to advance with their digital strategies. Now a company called Facecake has launched Swivel, a technology that enables online retailers to upload their entire apparel and accessory lines into a virtual wardrobe in which shoppers can try on clothes in real-time using their webcam (see a demonstration in the YouTube clip below). Make-up brands will likely also be adopting this technology as shoppers can use their webcam to apply makeup in different colors and shades. In addition, shoppers can change the backgrounds, snap photos and share them on their social networks. Users can then create polls so friends can vote on which outfit suits them best. This opens a vast array of new possibilities for brands to increase their profit and limit the returns from online sales. The technology is new and won't work perfectly yet, but it sure is a huge step towards the future of retail. Even though the expectations are high, advertisers have not been able to successfully leverage the new world of mobile ads. Most marketers report not seeing the great performance of these ads and have difficulty justifying their budgets. They are resisting the tendency to create processes that require fewer tasks. According to a report published on Media Post, 58% of american adults that use smartphones access the Internet several times daily, followed by 21% daily, 12% weekly and only 3% never report never accessing the Internet from their smartphones. An example of what an ad should look like. There are currently over 2 billion smartphones worldwide that serve 31.3% of the world's population. The opportunity for marketers to reach these consumers is real, but had not been exploited fully through personalization and hyper-targeting. The data is available through the consumers interactions with the phone's camera, the GPS system and the searches. 57% of adult smartphone users view the ads that typically appear in apps are interrupting the user experience rather than being complimentary to what they are doing. Only 20% say the ads are relevant to them. Leas analyst Jennifer Wise explains in the Forrester Research World Smartphone Adoption Forecast, 2012-2017, Global that the majority of mobile ads still resemble mini-desktop ads. Analysts believe focusing on the mobile user experience and integrating with individual publishers will reduce customer frustration. By targeting individuals and not segments the ads will appear more relevant. The Apple Watch- everything I hoped for and less.